I am Ennio Morricone Fan from China. 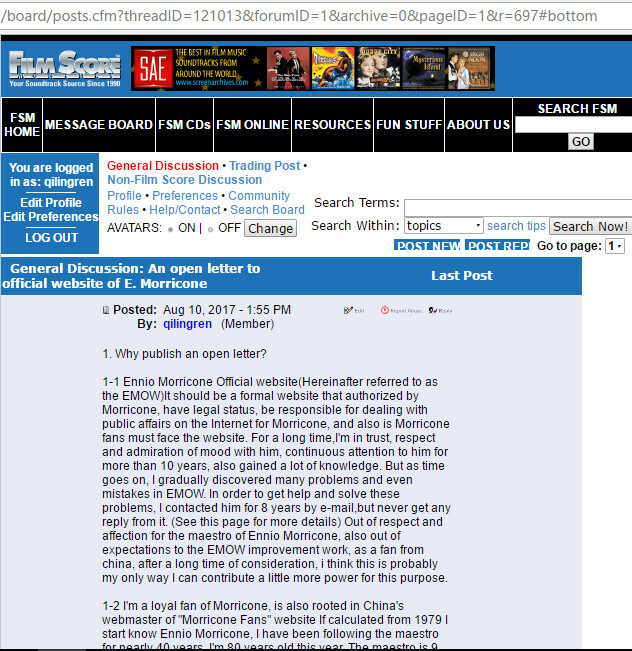 A post "An open letter to the official website of Ennio Morricone" wrote by me has been published in the "Morricone Fans Community (Forum)" today (See here). I hope you have a look it so that we can exchange views. Over the years, your website has done a lot of work, I also gained a lot of knowledge from here. But there are also many problems that need to be solved. The purpose of the open letter only is for to promote work, maintain the due authority of the official website and the distinguished image of the maestro Ennio Morricone. I hope we will find common language. I hope the official website will become a good mentor and helpful friends for worldwide Ennio Morricone fans! I need your complete text to see your categories of works, A1, A2 , etc. However, I can already answer you "in general". I agree with you about the unforgivable omissions like Una nuova ..., Il libro dell'arte, Giovanni ed ..., Gli indifferenti, Roma ..., Padre Pio, La ragione ..., etc. 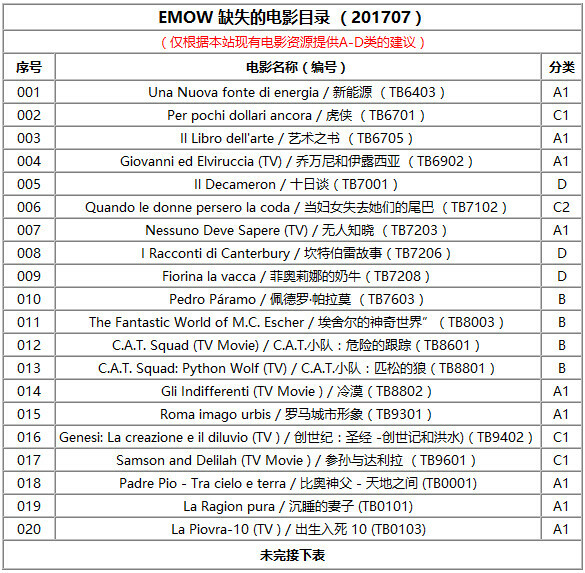 Per pochi dollair ancora is an example of borrowing a EM's theme in the score (and even re-arranged by Ferrio) in order to put EM's name in the titles. So it is anecdotical, and no work by EM is here. Idem for Quando le donne persero la coda : it could be cited only because the music from Quand le donne aveva ... is partially used in the second film, logical to not be mentioned in a filmography. Idem for Pedro Peramo, CAT Sqad, the numerous episodes of La Bibbia, etc. At the contrary, I racconti di Canterbury does belong to the A2 (I believe) category because track Allison is a true EM's composition, published. Almost idem for Django unchained : the song was intended to include a CD song, but the temporary track sent to Tarantino is a different version, minimalist, which can be understood as a true genuine arrangement for the film (I admit it is a doubtful thought). 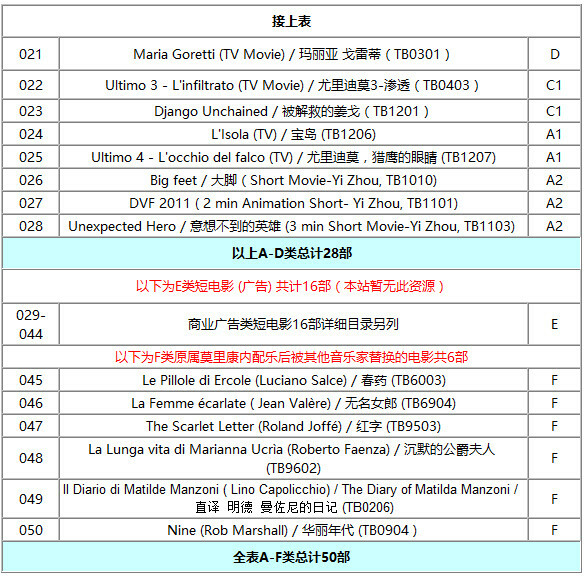 At least they could be inspired by Inseguendo quel suono filmography , by far more complete, to add titles and correct errors. I consider that what is important in a filmography is the real original works for the movies. If we mix up these works with use of existing music or minor works like conducting only, you loose the pertinent information and you "loose yourself". That is my first impressions I wished to send to you, after your useful and good idea of open letter. I have doubts about a reply, though.